The media has been talking so much about “Black Friday,” expanding it to “Black Weekend” and beyond. This traditional launch of the Christmas shopping season occurs the day after Thanksgiving, and theoretically got its name from the fact that it is the day that is supposed to start putting you in the black for the year (in other words, make your store profitable). But will it? The whole focus of Black Friday is discounting, and there is even a web site called BlackFriday.com that shows shoppers where the best “doorbuster” deals will be. Shoppers line up early to get bargains, mostly on electronics, appliances and toys. You don’t need me to tell you that you are not likely to win in a game being played by Walmart, Best Buy and other deep discounters. These stores have the ability to bring in products that are either loss leaders or are produced so inexpensively that they can still make a profit. You can’t compete in this race to the bottom on price, so I suggest that you leave the frenzy on Friday morning to the big guys, and focus on what you do best. Customer service, an enjoyable shopping environment, and an inventive product selection are hallmarks of a good independent retailer. Make sure that you are ready to shine in all three areas as you launch your holiday season. What can you do to really excel? 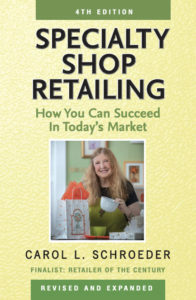 Make sure that the public knows how wonderful it is to shop in your store. Another advantage that your small business has over the big box stores is that fact that America is really starting to embrace the “buy local” concept. Many of our “local first” organizations are doing special events and advertising to encourage shoppers to patronize small business. Even the giant credit card company American Express is getting on the bandwagon of promoting independent business, especially through social media like Facebook. Hats off to American Express for their creative Small Business Saturday promotion, which invites shoppers to spend $25 or more at a small business on Saturday, November 27. American Express will then give the shopper a $25 credit — quite a sweet deal! One of the motivations behind this promotion is undoubtedly to get more stores to accept American Express, but it is still a meaningful and welcome effort. 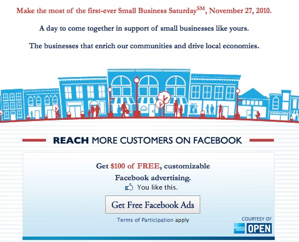 Participating businesses are even eligible for free a Facebook ad sponsored by American Express. By the way, the term “Black Friday” is actually thought to have originally been used to describe the fact that the city of Philadelphia was “black” with traffic on this popular shopping day. Let’s hope your area is that busy this year!